Yes ... I am Newbie Handliner ! Here goes my old history again just in case some of my friends forgotten about it. My first fishing experience donkey years ago was a plastic handline spool bought off the shelf for $1.20. Comes with a hook too ... very happy that my dearest had bought me my first fishing equipment ! I was left alone to figure out how to use the "hand-line" ! Loosen a few feet of lines and cast it out without much strength. And of course I am not happy with the cast ... it didn't reach far as I have imagined. A pair of unfriendly eyes was peeping over the edge of the high wall at me. A BIG kukut was landed and I happily jumped in joy declaring victory of a GROUPER ! Most important fact ... I caught my first fish on a handline. A recent trip to a Kelong got me deeply hook onto handlining, again. What if a "biggie"decide to take me for a test run ? Simply great fun and definitely different from fishing with rod and lines. To begin ... 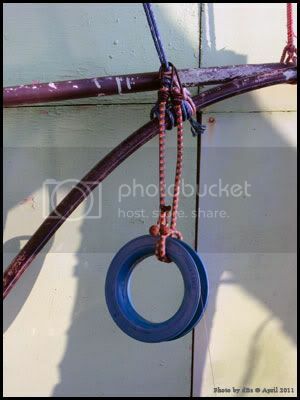 I got myself a wooden handline spool loaded with 100lbs handline. Don't laff leh ... I guess it natural for newbie to go THICK on first try and slowly lower down the poundage. Will be using it at the Kelong again ... with the terrain ... 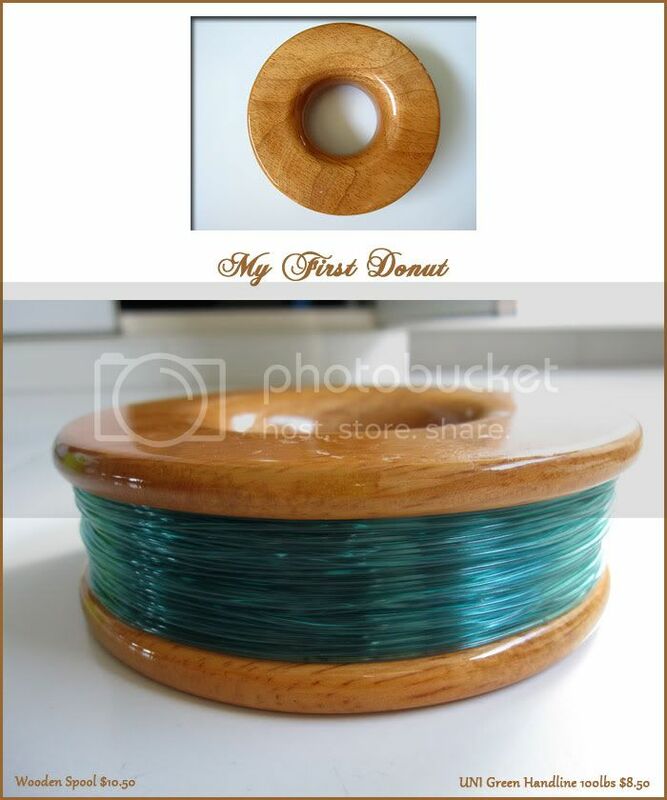 I have chosen thick line with small spool. Doing direct drop mostly so I guess a small spool has better grip. Any advise from the gurus here ? Do I need to attach a leader line to the main line like we do with braided lines ? Re: Yes ... I am Newbie Handliner ! Aha, so someone saw ray of light in the fun of handlining. Your new spool looks really polished, it's nothing like my pile of worned out spools with chipped edges. Poundage to use largely depends on the type of spot and fish, I can't say 100lbs is a sure overkill. In close quarter situation like that Kelong you were fishing at, it's a good reason to use such high poundage to pull fishes away from structures. For selection of spools, it depends on what you'll be using it for. Generally, the deeper waters you fish the bigger the spool must be. 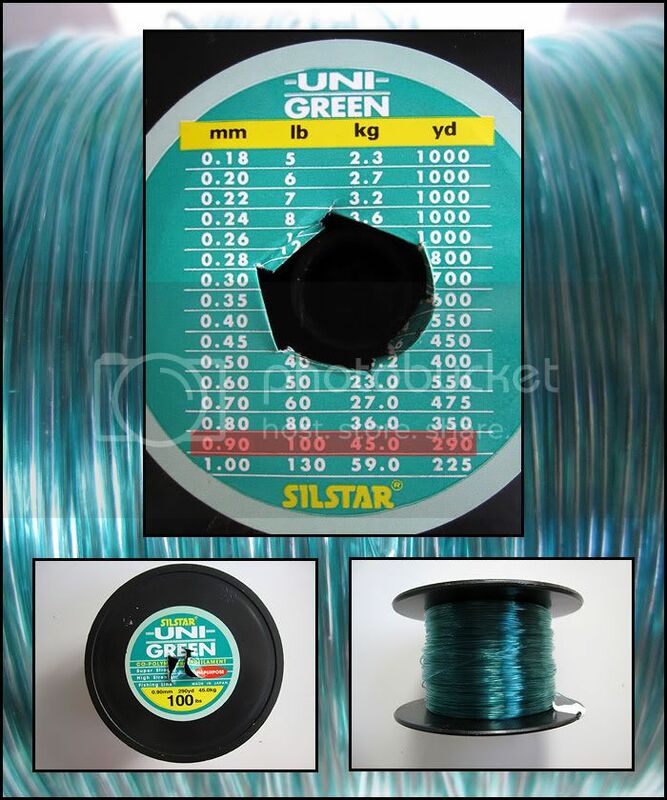 This is so you won't tire yourself out winding back the line compared to a small spool. If you're using for casting, you will want something of middle size and light. Those plastic ones are great but they don't last as long as the wooden ones. Your 100lbs line is not good for casting though. For your hooking tying issue, you may have to attach a lighter leader line if you want to use a considerable small hook. Most tackles are designed in proportion, that is to say big hook for heavy lines that catch big fish. So with that 100lbs line, you're supposed to be targeting for those big groupers hiding under the Kelong. Go head and use a bigger hook and get a lighter set to play smaller fishes. As for attaching the leader line, you can use a barrel swivel. Good luck on your handlining, I hope to see you report back here with progress. edit: Just a word of caution. Heavy handlines can be more dangerous than lighter ones and you must pay attention to lines laid on the floor on retrieval. If a biggie shall take your line and your limbs get caught in the loop, you'll be water the next second. While lighter line aren't as friendly to hold but they certainly break more easily in times of emergencies. 1:To cast a handline, u have to swing it around ur arm and then throw it into the air. Returned from Chia Soon ... I am 100% addicted to handlining. Never really made an effort to try hand-line all these years. And simply cannot understand why people like to do hand-lining. I finally got the answer after trying it out. Scary cat I am ... worry will get cut. But I guess ... that is one thing you cannot avoid if playing with hand-line. On the 2nd trip to Chia Soon ... I was not prepared so just peeled off some 12lbs mono lines from Oinky to stand in as handline. The feeling of a hook up was sensational. It was as if you had used your finger as bait. I felt the slightest nibble almost instantaneously. This trip ... determined to play handline only. I got myself the first donut loaded with 100lbs line. I don't feel a thing unless it is a real BIGGIE. It's a drastic difference from the previous trip using just 12lbs line. But ... there is one definite advantage with thick lines. You will never get sangkot. With a light tug or assert a light force with the spool and the rig came back intact. the hook came back straightened but my line was as good as new ... no injury at all. Will be downgrading a little ... any advise what lbs will be more suitable for Kelongs ? Here something interesting which I want to share. Waiting for the fish to strike. And if you take a closer look ... there is a bell attached just so it will alert you when fish strikes. A very good idea isn't it ? Has anyone try out this method ? Or this is the way handline should be park ? Definitely going to try it out on my next trip. How high of a poundage to use depends a lot on the place you're fishing I guess. 100lbs is not overkill considering if you're fishing among tight structures like a Kelong, of course this is only good for waiting for a biggie. For something you can hold and play with, you will want a lighter handline which you can actually feel the bites. You can go for 0.40mm - 0.50mm mono lines for a start if you're not too familiar with handlining. As you get more experience with it, you'll find a comfortable diameter you like to use with a good compromise of strength and feel. For parking a handline, the bicycle hook is a pretty common method people use. I personally use that though I don't quite like it because the lines can actually come off the spool and get coiled into the bicycle hook itself when the spool spins. When this happen, the line cannot go out anymore though you have some elasticity from the bicycle hook to help out a little. This isn't too much of an issue if you're using heavy lines as it is strong enough stop most fish without letting out much line, if any. dBs !! Get one bicycle hook for meeeee ! I got hooked using handline too ! Recently, went for a local boat trip @ west and was using ~80lbs handline for the whole trip. Got a small parrot and grouper for the entire trip, not really fantastic though, just manage to get the feel of hurling fishes up from deep waters and of course, their intial burst ! (My fingers did have some abrasion, imagine if a biggy takes ur line for a run ). We were fishing at depth range from 50 to 100ft, kinda tiring, especially when you need to use heavier sinkers compare to those who are using rod. VIDIC ... BO JIO !!! And it's only recently that we got addicted to playing with hand-line. I have seen a friend who handlined on a boat trip, a 2Kg Chermin took his bait ! What I witness is enough to be a deciding factor that I chose to go with 100lbs mono lines. Even with that I have this fear factor set deeply in me. The fear of hooking up a biggie .... LOL ! Yeap ... never have this fear with rod and line. It's the bigger the better. I am still unsure if I want to handline on the 14th trip. Vidic ... a small suggestion for you ... handline on Crystal Coral ! Beat the kitty to a humongous catch on handline ! Heavy game handlining is about brute force, light handlining is more about finesse. Trust me, the latter is much more fun. WHO WILL BE THE NEXT OLD MAN AND THE SEA???? Comon, whose gunna do it its not impossible..
Go ahead and do handline. Handlining along breakwaters and shallow grounds are interesting. Else can always switch over to rod and line if currents gets too choppy and strong. If he scold you .. tell him this "WE PAID $400!" 2) How to decide which kind of knots and rigs to use? It is mostly on trial and error or does observation of the fish in the waters help. Would appreciate if seasoned handliners could share their views and experiences! Hi Shrimp and a warm welcome to HLF. It is possible to lure with handlines but it won't be as efficient or effective as with a rod. You may like to try surface cruisers, woodchoppers, spoons or spinnerbaits. These lures works well with a simple constant retrieve that won't go too taxing on arms. They cast well too. Knots and rigs depend on the type of place and species of fish you're targeting. Generally when deciding on a rig to use, you have to consider first if the rig can reach where you think the fish is. That means the rig's castability or if it can sink or float at a particular depth and at what rate. Next you consider the presentation of the rig to the fish you're expecting. Take a stingray for example, it hunts and scavenge for food at the bottom of the seabed. So you'll want your bait close to the seabed and a long hook line so that the ray can take the bait easily. With that, LSBF comes to mind. So it goes down to understanding the spot and the fish behaviour to decide on the rig to use. Knot is dependent on the configuration of your rig and how you want to tie it. You should be able to tie most rigs just learning snell knot and surgeon knot/loop. You proceed to learn more stronger knots as you go along. Observing for water action is a good habit for fishing. When there's water thrashing, it's a tell tale sign on the activeness of fish and their mood to feed. You should pay more attention to your lines during those times.